So, with a brief break in the weather yesterday I decided to turn my back step into a fleece laundry, trying to make some headway in processing the fleece I was gifted at the beginning of the month. The tools required. A old washing up bowl to wash the fleece in. A mesh laundry bag, designed for washing your delicates but very good at keeping the locks together. An old roasting dish which is somewhere to put the wet (and very hot fleece) while refilling the washing up bowl. 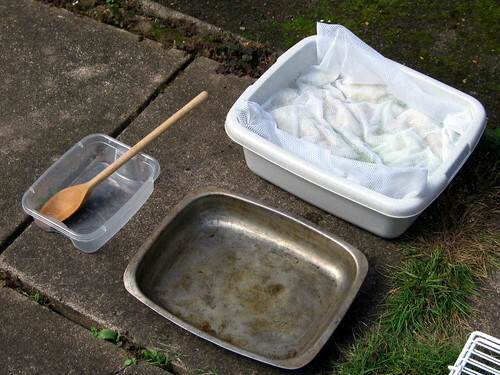 A wooden spoon for gently pressing the fleece into the water, as recently boiled water will scald if it touches skin. Not in shot, the kettle, my detergent of choice (washing up liquid), vinegar and rubber gloves. I've modified my technique slightly and have done away with all notion of cooling the water, going instead with completely unadulterated boiled water from the kettle. I've decided that this fleece is so greasy it needs it! I'm also being very, very generous with the detergent. So generous that I'm lucky to get three lots of fleece washed with one bottle. 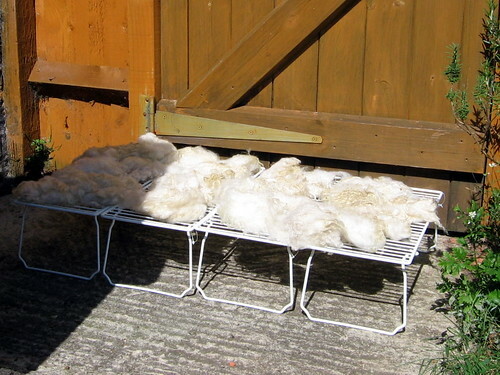 I've also looked around for suitable drying racks, something portable that will lift the fleece off the floor and allow good air circulation. I was trying to get hold of a sweater dryer but have been having problems, so in the end I picked up some cupboard shelves from Wilkinsons. 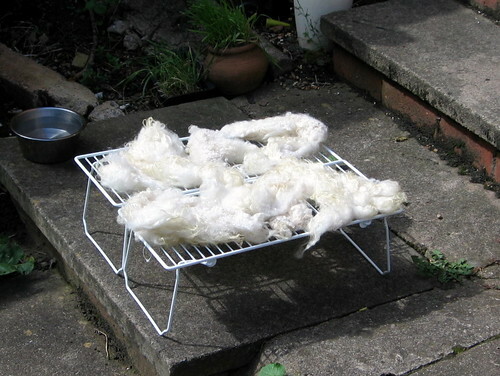 They're doing the job nicely. Naturally, while I was engaged in being productive, the cats helped. And Charlie guarded the drying fleece from potential marauding squirrels from under the lavender bush. I'm getting through the fleece at a good rate now and think that I'll be done with the first one after a few more afternoons spent washing it. I really want to see if the fleece is worth the effort I've put in so far before getting started on washing the second one, so this week I've ordered hand carders from Winghams. Hopefully I shall soon be in a position to spin up a test skein! Looks lovely from what I can see. I would say you should have asked to borrow my carders but that would involve me knowing where they are! !